Adnoc LNG's main shareholder declined to tell an industry event in London how it will market unplaced volumes starting 2019. Adnoc LNG’s 70% shareholder declined to say how it will market unplaced volumes starting 2019 at an industry event in London. In particular Al-Jaber was asked by NGW if the unplaced volume – about 4.2mn mt/yr from roughly April 2019 – would be sold on a spot basis, or through long-term contracts not as yet announced, or through joint ventures with existing LNG traders, or whether instead a significant amount of the wellhead gas would be consumed by Abu Dhabi’s petrochemical or other sectors. He also said that Adnoc would not pursue upstream activities outside Abu Dhabi/UAE, and would only invest in petrochemical or refining ventures outside the country. Adnoc is planning to investing $45bn alongside partners downstream at Ruwais, to the west of Abu Dhabi city, to create a plug and play manufacturing cluster and industrial hub, he noted. 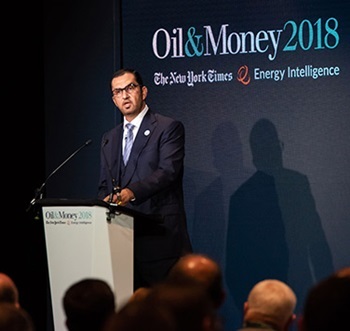 Adnoc has lately attracted a range of new investors into new and renewed oil and gas upstream concessions, including European and Chinese investors. Al-Jaber also said that an exploration round, comprising six on and offshore oil and gas blocks in Abu Dhabi covering a total of 13,000 km2, would close later this month and to date had attracted bids from 39 companies from all around the world.